Car collectors, restorers, hobbyists and enthusiasts will appreciate the new Collector Car Encyclopedia, from the publishers of Hemmings Motor News, the popular monthly, collector vehicle, buy/sell/trade magazine. Covering vehicles from the early years and including domestic and international sutomobile company profiles, this book is a must-have for anyone serious about the collector car hobby. But the information is not limited to just car company histories. This 288-page guide also includes information on auto auctions, clubs, events and designers, as well as useful info on brake systems, differentials, engines, hot rodding, restoration and more. Even a chapter on Toys and Models is included. The Collector Car Encyclopedia will make a great addition to the library of the serious car enthusiast, as well as a fantastic gift for any occasion. Display ads to some of the best automotive parts and services suppliers, including The Motor Bookstore, are also part of this great book, making it the perfect reference. Quantities are limited so make sure to order your copy soon! And it's prospering with continued growth year after year. There are more car clubs today than ever before, and each year the calendar gets more crowded with newly formed collector-car shows, concours, rallies, cruises, tours, vintage races, auctions and car-related television shows. When combined, all of these events have the positive effect of getting more people interested in owning, driving and restoring old cars. As these new folks get involved with the joys of owning old cars, soon they will want to learn more about the collector-car scene and everything that it encompasses. And what better source of information is there than an illustrated encyclopedia that profiles anything and everything relating to the old-car hobby? So that's what the editorial staff at Hemmings Motor News decided to create: a collector-car encyclopedia that embraces more than just cars; it includes everything associated with the history of the automobile and the fascinating leisure pursuit of the old-car experience. The Hemmings Motor News Illustrated Collector Car Encyclopedia is the ultimate visual guide to the automobile, starting from its earliest years. Within its comprehensive listings, there are profiles of hundreds of domestic and international automobiles companies, coachbuilders, designers and stylists and the pioneers who created them. Detailed entries describe the many different components that make up engines, transmissions, differentials, suspensions, brakes and ignition systems, as well as wheels, tires, interiors, lighting and more. Chapters on tools, machinery, paint, museums, concours, restoration, hot rodding, racing, toys and more combine to make this an indispensible resource for anyone involved with vintage automobiles. Automobiles from all the different eras are covered, as well: Brass, Classic, pre-war, Fifties, Sixties, and all the way up until the mid-1980s, which makes the Hemmings Motor News Illustrated Collector-Car Encyclopedia the one-stop resource for all enthusiasts. 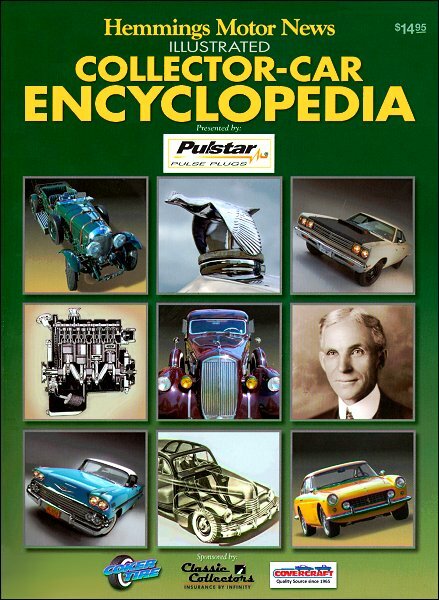 By design, this encyclopedia has been purposely written in a basic, simple to understand format so it will be easier to comprehend for those who are new to the old-car hobby. With several thousand entries, most of them illustrated with photography or line drawings for a clear, concise understanding of what the individual subject is all about, the Hemmings Motor News Illustrated Collector-Car Encyclopedia will quickly become the main reference source for all car owners, collectors, dealers, historians, teachers and budding young car enthusiasts, not only here in the United States but throughout the world. CORVETTE FUNFEST: Also Mid America Funfest. The Corvette Funfest is run by Mid America Motorworks and takes place annually during a weekend in mid-September at the company's corporate campus in Effingham, Illinois. Events include a downtown fun run, car show, seminars and many Corvette-themed charity events. DAS AWKSCHT FESCHT: This annual antique and classic car show takes place for three days, from Friday through Sunday, each August in Macungie, Pennsylvannia. It takes place at the Macungie Memorial Park and is know for its car show, car corral and swap meet. DAYTONA BEACH CAR SHOW/TURKEY RUN: Held annually in March, the Daytona Beach Car Show takes place at Florida's Daytona International Speedway. In addition to the car show, expect to see a lot of bikes and rat rods. The swap meet and car corral are also popular draws for this event. The Turkey Run is held every November and is similar to the March show, but auctions are also held. DUNKIRK: Every May, the Chautauqua County Fairgrounds in Dunkirk, New York hosts a flea market and car corral. Indoor and outdoor spaces are both available, and the event is usually run by the AACA. The three-day event runs Friday to Sunday. Ask a question about HMN Collector Car Encyclopedia.